Have you ever tried to make a phone call but the phone will us not go forward, and all you get is this error on the screen which states Not registered on network? Yes? Well, don’t worry. You’re not alone. Definitely not. I for one have come up against this error so many times I’ve literally stopped counting, but the solution, you see, is not a complicated one at all. But again, like always, let’s digress a little and find out why this problem actually occurs. Why do I get the error “Not registered on network”? Well, this annoying problem is often found in Samsung Galaxy devices, particularly when users update their Galaxy phone to the latest Android version and something goes wrong. 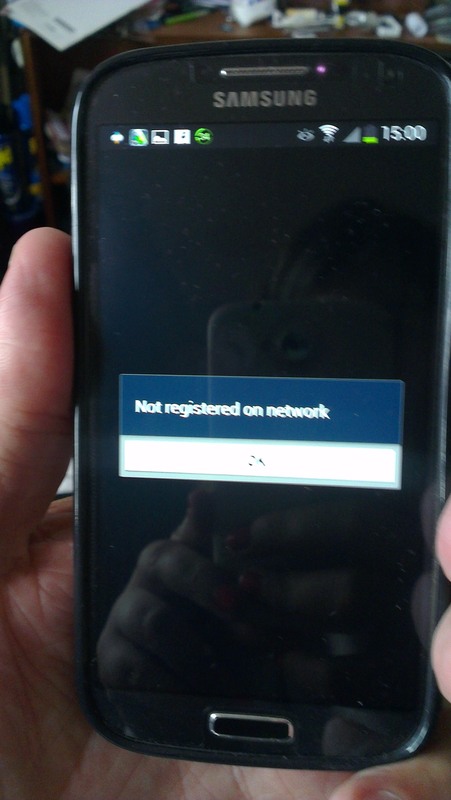 Their device is unable to detect the network and up comes the Not Registered on Network message. This occurs because after getting an update, your device IMEI number is changed to “SN 0000″ and it shows that your device SN number has been broken and need to be fixed. Another reason is when you try to use the SIM Card from a new Network Provider, and your Samsung fails to keep up when you’re trying to switch networks and needs a little help from you involving manually providing the new APN settings / Networks name in order to fix it. In this situation, the Not registered on network error will pop up when you attempt to make a call or text. This is simply because your Service Provider is simply not notified of your IMEI number so on the screen you will see Not registered on Network. Not to start about the little “OK” button they had the cheek to add in. What are you? A 12 year old teenager? Who when confronted with an issues gives you the odd “K”. Frustrating, yes, but not to worry we can solve this issue. First you should be aware that your phone is already unlocked. Wondering what an unlocked phone is? Well, an unlocked cell phone is one that is not tied into a certain carrier’s network: It will work with more than one service provider. Most phones are tied—or locked—to a certain cellular carrier, such as Verizon Wireless, T-Mobile, AT&T, or Sprint. So if your phone is already unlocked then you have no issues at hand, in case it’s then you’re gonna have to unlock your device in order to remove the Not registered on Network error. Dial *#06# to see the IMEI number on the screen. IMEI is a unique number assigned to your phone. Enter IMEI to the field provided. Do not forget to pass a captcha test. Verify that the IMEI is CLEAN and the phone is not blacklisted. Now you can be sure whether the ESN is bad or clean. For everybody else here are the four primary methods you can use to fix this problem and finally actually use your damn Cell Phone. Method 1: Manually select your new Network Provider. Here’s the first method on how to fix Not Registered on Network error. Step 6: In Mobile Networks, set Network mode as WCDMA only and restart your phone. If the above method fails to work for you then worry not, you can move onto the next solution. Method 2: Remove and Insert SIM. Step 1: Turn off your phone by holding both the Power Button and Home together. Step 2: While the phone is off, wait for 2 minutes. Step 3: After 2 minutes remove the battery and the sim card from the phone. Step 4: Next, hold the power and home key for 1-3 minutes. Step 5: Now insert your Sim card and battery. Step 6: Turn on your Samsung Galaxy. Step 7: With your phone on, remove then re-insert your sim card. This should work most of the time but in case it doesn’t, move onto method 3. Method 3: Update your Device and Samsung Account Software. Quick now: Before trying this method make sure you are connected to a wireless connection. Step 6: Wait for the cell phone to reboot and complete update. Now check if you’re able to make phone calls. If you can, thank us in the comments section below. If not move onto the fourth and final method. Method 4: Root your device and Install a Patch. Step 5: Just click on the button saying “PATCH, ” and it’s done. Those were all methods you can use to try on how to fix Not Registered on Network if this helped you out show us your support by sharing the post with your friends who might be facing the same issues. And as always if you face any issues even after using all these methods do give us a shout down in the comments section below and we’ll try our best to help you out!